Note that in the last 13 years there has been very little increase in OPEC production. Oil prices continue to climb steadily closing up about $3-4 a barrel by the end of last week. Behind the move are concerns that US shale oil production this year may not be as strong as forecast; lower OPEC production; and reports that the US and China are making progress towards ending their trade war. New York futures closed at $53.80 on Friday, while London closed at $62.70. This leaves London’s Brent about $12 a barrel higher than it was at the end of December, but $22 lower than it was in September. These prices should make the OPEC exporters happier but may not be high enough to keep shale oil production increasing as fast as predicted. The International Energy Agency continues to insist that global oil demand will be stronger this year than in 2018 as lower fuel prices counter slowing economic activity. Some observers are not sure that this analysis is valid. They point to the growing gap between the price of gasoline and middle distillates (diesel and jet fuel) that run much of the global industrial and transportation systems. Last week diesel in the US was selling for 68 cents a gallon more than regular gasoline. Last year the difference was 41 cents. The EIA reports that US gasoline inventories are about 6 percent above the five-year average, while distillate inventories were 3 percent below. Concerned observers note that the supply of very heavy crude, which is blended with very light shale oil to make middle distillates, is shrinking in Canada, Venezuela, and Mexico, its primary sources. The mandate to reduce emissions from shipping, which comes into effect soon, will further exacerbate the middle distillates situation. Some are starting to speculate that the middle distillates sector of the fuel industry will turn out to be the place where peaking of world oil production first becomes a problem. The OPEC Production Cut: The cartel published the list of oil production quotas for each country in the OPEC+ deal last week. With the exception of Iran, Venezuela, and Libya which are exempted from the cuts due to their precarious economic or political situations, the bulk of the cutting will be done by the Saudis and their Gulf Arab neighbors. Five of OPEC’s current 14 member’s oil production has been trending down for years and is largely inconsequential in the global 100 million b/d oil market. Riyadh will cut 322,000 b/d from its October baseline of 10.633 million b/d and keep output at 10.311 million b/d. According to OPEC’s secondary sources, the Saudis produced 10,553 million b/d in December, down by 468,000 b/d from November. They certainly seem to be doing their part in contrast with the Russians who are saying it is impossible to cut production during the winter or parts of their production infrastructure will freeze. Qatar, which has been producing about 600,000 b/d, has left OPEC and is no longer included in the cartel’s production data. The OPEC 14 production was down by 751,000 barrels per day in December. That was after November production had been revised downward by 23,000 barrels per day. Iran is now at about the average they held during the previous sanctions period. Iraq reached a new all-time high in December of 4,714,000 b/d. That was up 88,000 b/d from November. Kuwait also increased production in December, up 29,000 b/d to 2,800,000 b/d while Libya and Nigeria are back to having political problems slowing their production. 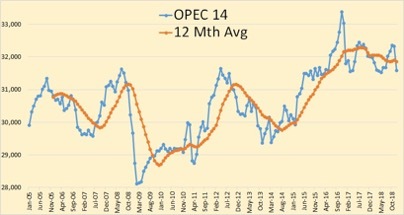 In its monthly Oil Market Report, the IEA increased its non-OPEC supply growth number for 2019 to 1.6 million b/d, from 1.5 million b/d in last month’s report, thereby lowering the fabled “call on OPEC.” The agency raised its estimate of the US’ crude output growth this year to 1.1 million b/d, from 1 million b/d in last month’s report, adding that US crude output would probably be higher than the production capacities of Russia and Saudi Arabia by mid-year. OPEC has decided to hold an extraordinary full ministerial meeting on April 17 in Vienna to discuss the state of the oil market and the production cut deal, while the cartel’s non-OPEC partners will join for a full OPEC+ meeting on the following day, April 18. The newest trend in the shale oil industry is large oil companies buying out the Permian’s smaller operators and pumping out the basin’s crude with in a more efficient manner. The large oil companies can bring vast resources and economies of scale to the shale oil business, and generally know what they are they are doing. They do not need to cook the books to convince lenders that they will soon be profitable. Indeed, they can bury their shale oil operations amidst the millions of barrels of oil they already produce from conventional wells. The supermajors are used to investing billions of dollars in projects that may return nothing for five or six, or sometimes, even ten years. Most importantly, they appreciate better than most that there has been insufficient investment in finding new oil so that shortages are almost certain to come in the early to mid-2020s, which will bring much higher oil prices. Drilling in Texas, even if it is for short-lived shale oil wells is much more attractive than production sharing agreements with the few countries around the world that will grant them access on money-making terms. The problem with investing in the Permian Basin is how many sweet spots are left to drill and how rapidly the cost per barrel will climb when companies are forced to drill less productive rock. If oil prices climb back well above $100 a barrel, and consumers can still afford to buy it, there may be profits in producing expensive shale oil. The supply and price of middle distillates may be the critical problem for the next decade. Iran: There is a consensus that Tehran currently is exporting about 1 million b/d, down from 2.7 million last May when the US withdrew from the nuclear deal. The Iranians are going to considerable lengths to circumvent the sanctions and to hide exports. The government continues to maintain that the sanctions are not seriously hurting it. The current waivers that Washington has granted to major importers of Iranian crude are due to expire at the end of May. The current thinking in Washington is that the waivers will be extended if there is a significant increase in oil prices by May. The Trump administration is pleased that it has been able to take over a million b/d of Iranian oil from the market without raising prices and hopes to keep it this way by judicious use of waivers. China’s largest refiner, Sinopec, has offered $3 billion to Iran’s state oil company to jointly expand the development of a major field in Iran. The sources of this information say Sinopec considers itself to be safe from US sanctions because the initial deal was signed back in 2007. Syria/Iraq: Iraq’s oil sector ended a record-setting year with its most prolific single month of crude production ever. Overall crude output from fields controlled by both the federal government and the autonomous Kurdistan Regional Government totaled 4.94 million b/d in December, according to an Iraq Oil Report analysis. Saudi Arabia: The Saudis now plan to take Aramco public in 2021 according to Energy Minister Khalid al-Falih. Gulf News quoted al-Falih as saying Aramco was the world’s most important and most valuable oil company. The minister said earlier that Aramco was planning to issue its first international bond, now worth around $10 billion – down from the $40 billion that was discussed last year — to fund part of the acquisition of a majority stake in petrochemical giant Sabic from the Saudi sovereign wealth fund. The larger bond issue was canceled after Aramco became concerned about having to make its accounts and reserves public. Recently, a third-party reserve audit by DeGolyer and MacNaughton found that Aramco had reserves of 263.1 billion barrels, a bit over 2 billion barrels more than the company has been reporting for years. Unless the Saudis can find a way around the requirement, a bond issue would also require the company to make its accounts public for the first time since its nationalization back in the 1970s. Libya: crude oil production and exports have been disrupted since early December due to port closures caused by bad weather as well as security incidents and issues at the country’s largest oil field Sharara, which has been shut in since December 8. As a result, Libya’s crude oil production in December fell to 928,000 b/d from 1.1 million b/d, according to OPEC’s Monthly Oil Market Report released last week. Last Thursday the national oil company opened all its oil loading terminals after nearly a week’s suspension due to bad weather. Libya produced an average of 1.107 million b/d in 2018, the oil company’s chairman Mustafa Sanalla said earlier this month. Total revenues reached $24.4 billion, the highest since 2013. If the security situation improves, Libya plans to produce 2.1 million b/d by 2021. Beijing’s economic woes continue. According to the Financial Times editorial board, the warnings we saw last year are a sign of the deepening economic distress, and that this will have a far more significant external impact in the coming year than it did in 2018. Despite more than a decade of efforts to rebalance the economy and wean itself off the stimulus introduced in the wake of the 2008 financial crisis, China remains addicted to ever-higher levels of debt and construction. The Institute of International Finance estimates China’s total debt exceeded 300 percent of gross domestic product by the end of last year. Last week, China’s central bank announced that it was injecting a record $84 billion into the economy to boost liquidity and promote increased lending. Despite hopes that a US/China trade deal will be reached soon, it may still not be enough to offset China’s lagging economic growth. Sources told Reuters last week that Beijing is planning to lower its economic growth target to 6.3 percent. This comes as China saw its exports fall unexpectedly in December by 4.4 percent, the most in two years, with imports also dropping 7.6 percent in their biggest decline since July 2016. For many years China’s economic growth has driven the global demand for oil. This year started well, with China’s crude oil imports for 2018 posting a 10.1 percent growth to 9.28 million b/d and imports for December at 10.35 million b/d, the second time it has ever breached the 10 million b/d mark. However, the imports are not consistent with actual domestic demand; much of the crude imported in the fourth-quarter went into building inventories, and imports mask high product re-exports. For 2019 S&P Global Platts Analytics expects China’s crude imports to rise to 9.7 million b/d, up from 9.2 million b/d last year. The growth in China’s demand for oil slowed to 590,000 b/d in 2018 versus 720,000 b/d in 2017 and demand growth is expected to fall further to 450,000 b/d in 2019. The Nigerian National Petroleum Corporation is worried about the rising incidents of pipeline vandalism across the country. In October 2018, its pipeline network suffered a 42.9 percent increase in the incidents of pipeline vandalism compared to the previous month. Giving a breakdown of the breaches in its infrastructure in a statement, a company official said the corporation recorded 219 pipeline vandalizations in October, compared to 125 incidents it suffered in September of the same year. With a population of 191 million, Nigeria still ranks among the top 10 among countries with the lowest gasoline prices in the world. According to the Global Economic Policy Initiative, Nigeria presently ranks number six behind only Venezuela, Sudan, Iran, Kuwait, and Algeria. Venezuelan crude oil production continued its steady decline and hit a new low in December with just 1.15 million b/d produced. Venezuela’s December month-over-month production declined 33,000 b/d, according to reports by secondary sources in OPEC’s latest report issued on Thursday. The new production figure represents a decline from over 1.2 million b/d in October, and an average of 1.25 million barrels in the third quarter. Citgo, Chevron, PBF, and Valero are major importers of Venezuelan crude, and the Trump administration has been resisting sanctions on Caracas’s oil exports. However, last week National Security Council staff told some US refiners that sanctions on Venezuelan crude exports are under consideration, a signal that opposition within the administration to sanctions on Venezuela’s oil sector may be weakening. While Washington has sanctioned state-owned PDVSA, restricting its access to new debt financing, the country’s gold sector, and sanctioned multiple government officials, it has resisted direct sanctions on oil flows. This reluctance was due to both the potential impact on oil prices and US refiners and the fear that oil sanctions could worsen Venezuela’s humanitarian crisis and allow it to place blame on the US. In addition, Trump remains resistant to any action that could increase oil prices. In October, US refiners imported an average of 505,870 b/d of Venezuelan crude, down from about 629,480 b/d in September, but only about 5,000 b/d less than US refiners imported in October 2017. Meanwhile, US refiners are bidding up prices for heavy grades of crude oil such as those produced by Venezuela. These crudes are needed to blend with the very light shale oils to work efficiently in US refineries along the Gulf Coast. Without heavier crudes to blend, it is difficult to produce diesel and other middle distillates. Venezuela also needs the light US shale oil to blend with the very heavy Orinoco crudes to make them suitable for shipping. “It’s more serious than I’ve heard before,” said a refining industry executive familiar with the White House discussions. “They are setting the table to pull the trigger if they have to.” US refiners would have few supply alternatives if the Trump administration were to cut off crude imports from that country. Supplies of the heavy oils have been harder to secure in recent months because of cutbacks and production curbs in Western Canada, Mexico, and Venezuela. One type of US heavy oil, called Mars, traded at a $6.80 per barrel premium to US crude futures on Thursday, the strongest in nearly five years and up from a $4.50 per barrel premium on Tuesday, a US oil broker said. The crackdown by Mexico’s new president on rampant fuel theft has turned into a battle to prevent economic chaos after state governments, businesses and consumers were caught by surprise by the decision. On Dec. 27th President Lopez Obrador unveiled a plan to increase military protection of oil installations and began cutting shipments through pipelines that have been bled for years by thieves. So far, the result has been more than a week of severe fuel shortages, shuttered gas stations, and lines of motorists snaking around city blocks waiting hours to fill their tanks. Lopez Obrador said that the government was looking at purchasing an additional 500 tanker trucks to distribute gasoline and that officials were asking private companies to increase fuel imports. Officials in three affected states told Reuters they were not warned about the supply cuts. “There was zero coordination,” said Alejandro Guzman, head of economic development in the government of Jalisco, home to the country’s second-biggest city, Guadalajara. “We started to notice when the gas stations began closing.” He estimated only a quarter of gas stations in the western half of Guadalajara had fuel to sell during the past week. Still, once the shortages became apparent, Pemex’s new management started to work well with the state to try to address the problem. Meanwhile, fuel continues accumulating at Mexico’s ports and storage terminals as the government struggles to accelerate deliveries to gas stations via truck instead of speedier pipelines. Mexico currently has almost 7 million barrels of gasoline, diesel, and jet fuel in dozens of tankers anchored around Pemex’s ports waiting to discharge. Some 5.3 million barrels more are stored at terminals, said Pemex Chief Executive Octavio Romero. Mexico’s government, dealing with fuel shortages stemming from this crackdown on theft, is expected to postpone a new rule requiring pumping stations to sell cleaner diesel, according to sources with knowledge of the decision and documents from the regulator. This marks the first delay of a 2016 regulation that had been expected to go into effect at the end of 2018. It has lost traction mainly due to lack of infrastructure, but also because of fears that it would exacerbate fuel shortages. Last Friday, a massive fireball engulfed people scooping up fuel spilling from a pipeline that was drilled into by thieves in central Mexico, killing 21 people and badly burning 71. Illegal taps into pipelines occurred 12,581 times in the first ten months of 2018, an average of about 42 per day. With crowds of townspeople often involved, either aiding thieves or collecting spilled fuel in primitive containers, it was only a matter of time before a fire occurred.